THE TREADLE OF THE LOOM: Heed Well, ye Pantheists! Melville, realizing that he made extraordinary demands on the reader in that Cetology chapter, generously rewards the reader afterwards: after a short interlude contemplating Ahab's multi-tiered crown in the "Specksnyder", we get some good old-fashioned slapstick in "The Cabin-Table" and a blissful reverie in "The Mast Head". The Cabin-Table continues some of the formal innovations that began being introduced as we left shore. 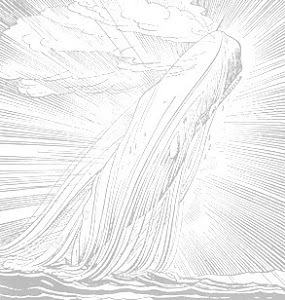 Now, Ishmael's voice is wavering, and a third-person narrator seems to be trying to edge his way into the book. Suddenly, we have scenes told by Ishmael where he is not present. Melville begins the transition carefully, almost imperceptibly, but it will become more pronounced quickly. The Cabin-Table, like many chapters, easily splits in two, with the first half emphasizing Ahab's royal table, which is carried out each day with great ceremony and deference, much to the dismay of the lesser nobles who serve Ahab. Watch carefully the language here, and remember throughout that at least two of the harpooners have already been identified as royals in their own right. Part two of the chapter features the more lively and democratic table of the harpooners, one which none-the-less plays havoc with the servants. Here is where the real slapstick occurs, as the poor Dough-Boy finds himself at the mercy of hungry savages who gleefully salivate over the prospects of having the Dough-Boy himself on their plate. The bifurcated chapters beg for comparison (indeed, Melville introduces the second part with the words "in strange contrast"). When comparing, expect a richness of ironies almost folding in on themselves. The democrats are baronial while the nobles suffer privation. Though nominally included in the census of Christendom, he was still an alien to it. He lived in the world, as the last of the Grisly Bears lived in settled Missouri. And as when Spring and Summer had departed, that wild Logan of the woods, burying himself in the hollow of a tree, lived out the winter there, sucking his own paws; so, in his inclement, howling old age, Ahab's soul, shut up in the caved trunk of his body, there fed upon the sullen paws of its gloom! That is wonderful, lulling and rhythmic language, but there references are themselves worthy of ponder. Let yourself be mesmerized as you read, but go back and scratch your head a bit when you're done. The phrasing is fraught with religion, history and mythology. Read in it claims of ancient Egyptian primacy, and the genuflections to monastics and early Christians and Rhodes; the references to heros of many lands (Washington, Napolean, Nelson); progress from there to historians and fablists; and finally, arive at the philosophers and poets. Like the man on the mast head, blissfully bobbing with his mind adrift, we survey a broad expanse here before reaching the end, where we are reminded that there are dangers to our reverie. Reveries interfere with commerce; indeed, they even threaten survival. Yet, it's been a pleasant read, and Melville's set up a great transition from one daring and difficult chapter in Cetology to a series of truly unexpected chapters to follow from here.